So now it's time for a review on two not so natural products, like I said, I do indulge in some not so great products (in terms of containing chemicals) from time to time. So since I don't party and go out as much as I used to, I only use these products on the nights that I do, and those are few and far in between ( I only use highlighting methods when I'm doing something that's not too casual). The two brands I've tried for this effect are Mac Mineralize skinfinish in soft and gentle (about 30$), and Physician's formula in translucent (about 15$). I use them both, I def. do find them different. If you look at the closeup that I took bellow the PF brand is a bit more talc like (a bit more white powdery) whereas the Mac brand is a more solid shimmer consistency. I find the PF to be more for a casual application, and the Mac for a more Glam look (although it isn't too much as long as you don't overdo it). I mostly use the Mac product as it gives my skin more of a silky shiny look. To apply, I usually apply my foundation first, then loose powder to set, bronzer, The chosen highlighter, blend with my powder brush (without applying more powder) add the blush, blend again with my powder brush without adding more powder, and voila! 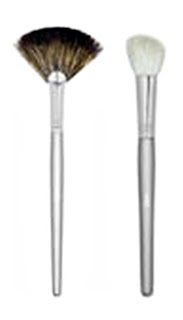 I use the brushes above for the highlight application. CON: They both contain talc so I would not be able to use this everyday or I would break out. 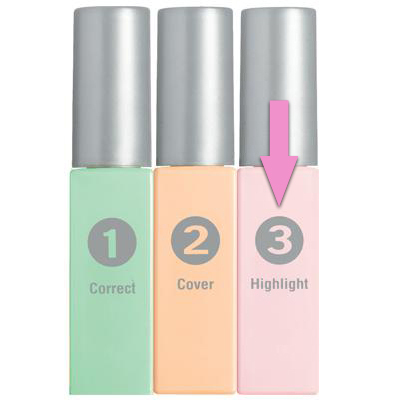 If you're interested in a talc free option, I use a Physicians formula highlight product below sometimes that contains no talc, but its a more liquidy application that must be dabbed in with the fingers or a foundation brush.